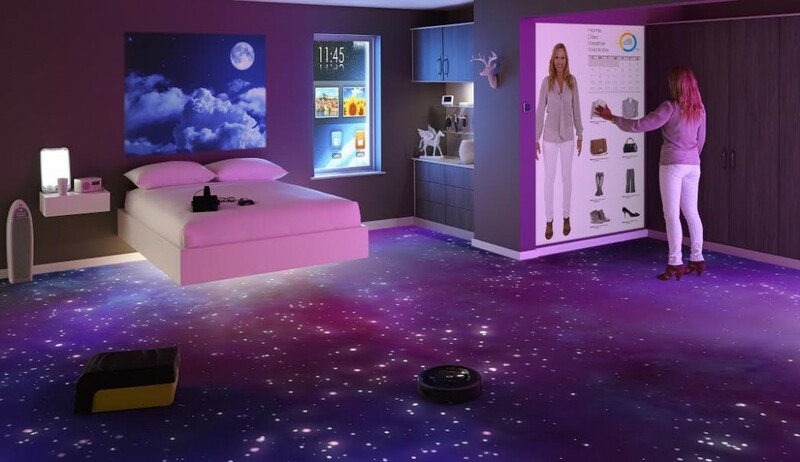 Chris Price looks at some of the latest developments which are about to revolutionise your home’s lighting, including smart bulbs which can be controlled via your mobile phone and systems that can be integrated effectively with your home’s security – even provide multi-room audio! Our homes have been utterly transformed over the last 100 years. We now have flat screen TVs, fully fitted kitchens with shiny appliances, state of the art bathrooms with his ‘n’ her sinks and gadgets to fill every room. But it’s fair to say that when it comes to lighting not that much has changed since Thomas Edison first invented the lightbulb back in the 1880s. Sure we may have more eco-friendly, longer lasting halogen and LED light bulbs in our rooms than back in the days of the incandescent light bulb. But for many people that’s about as far as it goes. Wouldn’t it be great if you could control your home’s lighting remotely without having to use plug in timer switches or change the colour of your room’s lighting to suit your mood without having to resort to buying coloured light bulbs. Well now you can and it needn’t cost a fortune either! One of the biggest changes over the last few years has been the introduction of easy to install control systems. Whereas once you would have had to spend thousands of pounds on installing a dedicated wired system from American firms such as Crestron and Lutron to control your home’s lighting, now it’s possible to choose from a number of intelligent, wireless-enabled lighting systems. Leading the wireless lighting revolution is the Philips Hue system. Launched in 2012, the starter pack will set you back a relatively pricey £180 for three LED screw fit light bulbs (bayonets aren’t available) and a bridge that connects via Ethernet cable to a wireless router. Control is provided via an Android/iPhone app so you can adjust the lights via your smartphone wherever you are in the world. Up to sixteen million colour options are available via the colour wheel within the app (surely more than enough) and it’s now possible to expand the system with up to 50 Hue light bulbs. In addition to the standard Hue light bulbs, spotlights, uplighters and strips for under counters are also available. Philips claims the standard screw fit bulbs give the equivalent of a 50 Watt standard incandescent light bulb and will work for up to 10 years. Each Hue light bulb, it reckons, also uses 80 per cent less power than a standard light bulb. One interesting feature of the Philips Hue system is integration with the popular If This Then That (IFTTT) facility, which lets you set up a series of automated commands or ‘recipes’. With IFTTT and Hue, you could set your lights to change to a warmer colour if the weather forecast shows that it’s dark and raining outside or tell them to turn off completely at a certain time. At a recent hackathon, one hacker even used Hue to show you when to leave the house for your bus – turning red when it was time to go and flashing if you were about to miss it. 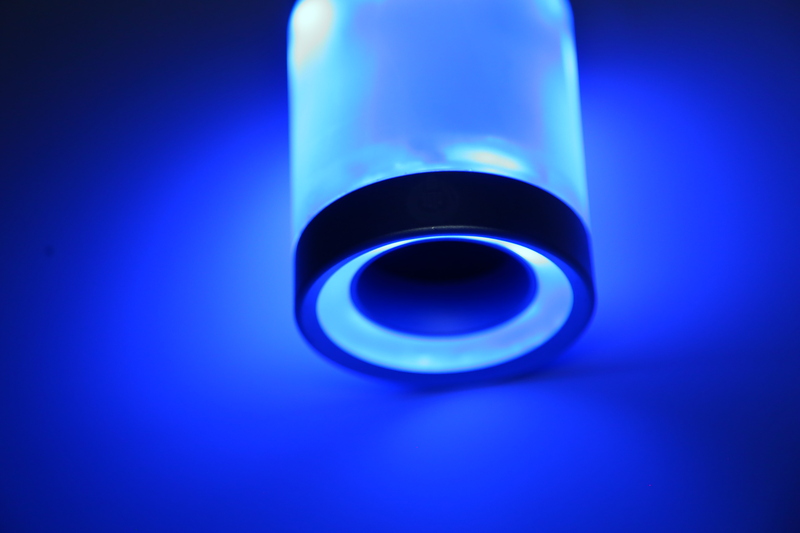 Philips isn’t the only company working on personal wireless lighting systems. Other brands joining the fray include Belkin, which has just launched its $99 wireless LED lighting system called the WeMo. Comprising two smart (ie wifi enabled) LED lightbulbs and a control hub, it’s similar in many ways to the Hue (additional light bulbs are available for $29 each). Rules can be set so that the bulbs come on or go off at certain times and brightness can be adjusted so that, for example, lights come on gradually at sunrise and go off gradually as it gets closer to bedtime. What’s more, the WeMo can be integrated with other Belkin home automation products such as security cameras so that all the lights in the house could be programmed to come on if there is an intruder in the property. However, the big difference between the Belkin and Philips solutions is that unlike Hue, the WeMo doesn’t provide coloured lighting. One of the biggest trends in lighting is to integrate it with other technologies. Undoubtedly one of the most innovative solutions to have been developed to date is LightFreq – described by the company itself as the ‘lovechild of Philips Hue and Jambox’. Although not actually available to buy yet, it’s so far managed to raise over $275,000 on crowdfunding website Kickstarter (the original target was just $50,000). Like the Philips Hue and Belkin WeMo, LightFreq (pictured above) uses ‘smart’ LED lightbulbs that can be fitted into existing screw sockets and controlled via a smartphone app. But it doesn’t stop there. Rather cleverly the light bulbs also feature built in speakers so you can play music through them via a Bluetooth-enabled music device such as an iPhone or iPad. All functions of the LightFreq can be controlled independently so you can decide whether you want to listen to music with the lights turned on or off. As with the Philips Hue system, the colour of the lighting can be controlled via the app (again sixteen million colours are available) and of course it’s possible for the home’s lighting to change in time with the frequency of the music if you so desire. Another interesting feature is a built-in intercom so you can speak into your smart phone via the app and your voice will be transferred to any of the LightFreq bulbs your home. You could certainly have some fun with that feature, waking up members of your household on a morning shouting ‘Rise and Shine’ at the top of your voice! One of the biggest issues especially for those living relatively far north at this time of year is the lack of daylight. Typically in the UK in November/December it’s only actually light for around 8 hours a day which can be very depressing as well as making it difficult to get up early. One option to combat SAD (Seasonal Affective Disorder) is to buy daylight bulbs or a special lamps. Models include alarm clocks like the Lumie Bodyclock which wakes you up gradually with increasing ‘natural light’ rather than the ear-piercing shrill of an alarm clock (though this is still available if you are the kind of person who can sleep easily during the day too!) To see how this works watch the YouTube video below. Other products include light boxes and lamps for putting on your desk which are designed to keep you awake and motivated while you are working. Prices start at around £40, but you can spend over £300 on more advanced solutions like the Innosol Supernova Bright Light Desk Lamp. “Pillows could incorporate the same light technology used in lamps to combat the symptoms of SAD, and they could light up gradually as you awake,” continues Barry. With demand for housing continuing to grow, especially in big cities, the need for going underground – especially in areas where it’s not possible to build upwards – is greater than ever before. However, living in a basement can be pretty depressing with very little opportunity to provide natural light. One company hoping to make living underground more bearable is Italian firm Coelux. 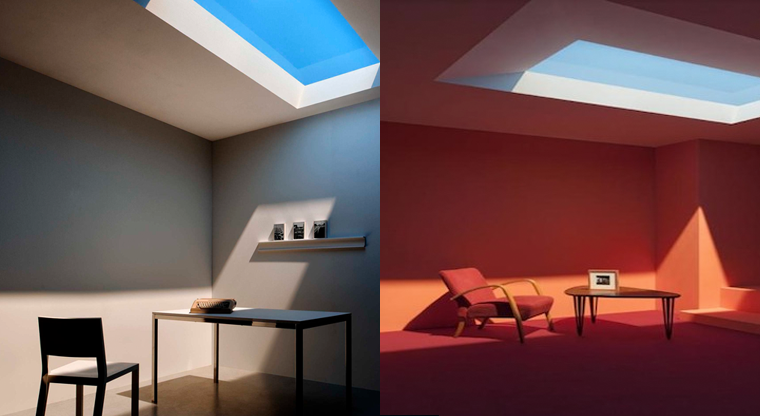 It has developed an ‘artificial skylight’ which gives the impression of sunlight, but isn’t (see picture below). By using a special kind of ‘nano particle technology’, Coelux mimics the way the sun refracts through glass in particular countries. So, for example, Coelux 45 places an LED lighting system behind a pane of glass placed at a 45 degree angle to create a Mediterranean vista. Nominated for the light source innovation of the year award at this year’s Lux awards, Coelux’s solution will be demonstrated to the UK public for the first time at LuxLive at the ExCel in London next week (see www.luxlive.co.uk for more information). Di Trapani likens the development of the artificial skylight source as signalling a major shift in the way we live as it will enable people to live comfortably underground in ‘earthscrapers’ in the same way as the development of the lift heralded living in skyscrapers. While development in wireless control and the advent of ‘smart lighting’ has provided great opportunities for many people to install more advanced systems in their home than ever before, there is still no substitute for great lighting design, reckons Iain Shaw of Yorkshire-based company, Brilliant Lighting. According to Brilliant Lighting the skill of lighting a house isn’t in the control of the system, but about emphasising the bits that need to be emphasised and downplaying what you want to de-emphasise. For example, the company has just completed a swimming pool and spa complex at a home in Harrogate (see picture at the top of the page) which looks amazing. Not only did the company produce a light under a David Harber sculpture to throw a lovely shadow on the ceiling of the pool it also worked hard on getting a colour for the granite wall to make sure it perfectly emphasised the colours of the stone. And while such attention to detail doesn’t come cheap, it is undoubtedly money well spent for the client who has invested heavily on materials. Sadly, not many of us have the budget to incorporate such stunning lighting systems in the home, let alone the pool and spa. However, at least the shift towards intelligent lighting is now making it possible for most of us to have more advanced solutions than a simple bulb hanging from a cable in the ceiling! And that’s got to be progress. Thanks for this overview, Chris. I thought I actually knew all of the various lighting/automation brands out there, but you surprised me with a few. I’m a big Philips hue user, but it’s also worth mentioning LIFX. They have a few disadvantages (price, heat, app ecosystem) and advantages (better blues & greens). I make an app that controls multiple brands of bulbs at once, and have users that have a mixed setups. From all I’ve heard, the jury’s still out on the “best” connected home bulb, but in the meantime it’s fun to see them all duke it out. I think one big factor will be who is the first to market with full HomeKit support so that iOS users can control their lights with Siri. If you’re interested in trying LIFX, you can get 15% off bulbs by following this link and entering the discount code at checkout: http://lifxstore.refr.cc/JFS6XKW Both LIFX and Philips hue are fully supported by Lightbow’s new animation features, which you can read about here: http://ow.ly/E2qmc Let me know if you’re interested in reviewing it and I’ll provide you with a free redemption code.